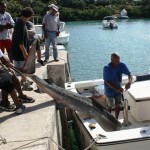 The Robinson’s Marina Fishing Tournament was held today [July 18] and the highlight of the day was the massive tiger shark reeled in by the team aboard Sea Horse III. 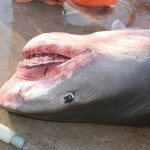 The shark, which we measured at 11 foot long, wasn’t weighed however many veteran fishermen in attendance estimated its weight at 300 – 400lbs, with some estimating the weight even higher. The fishing team consisted of Raymond Raynor, Gavin Lee, George Jackson, Allan Jackson, Rayquan Raynor and Junior Warner. The gentlemen told us they went out with intentions of making a big catch, and caught this shark in the Challenger Banks area. 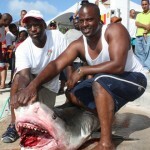 They said it took about 60 – 90 minutes to catch the shark, with Raymond and Gavin putting in the bulk of the work. 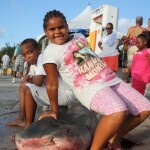 We asked the question that many non-fishermen would wonder…how do you get a shark of that size on the boat? 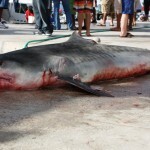 The fishermen explained that once it was hooked, one of them tied a rope around its tail, and all six of them combined together and pulled the shark on board. 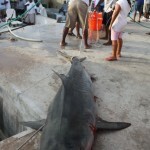 The team, who were all quite young and looked very physically fit, said it wasn’t exactly an easy task, and it took 15 – 20 minutes to get the shark onto the boat. 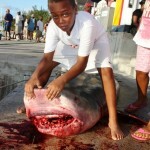 That’s sick and disgusting and why are those children sitting on the shark and standing in it’s blood? WTF? 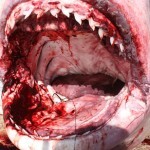 Don’t tell me about sharks being in the water coming close to the shore blah blah. The water is their natural habitat. We are not supposed to be in the water, when a shark attacks you at ice queen then I wont feel so bad looking at these pictures. I don’t give a damn if people have been fishing forever you moron. Humans have been murdering eachother for forever and it still doesn’t make it right. I’m not clicking your stupid link either. I’m sure it’s about something else that we humans do that’s unnacceptable but THIS post is about a dead shark now kick rocks. You are a classic moron. Like i said,GET A LIFE!You need one bad. Not To Bother,But Are You A Merman,Because If You Are I’m So Sorry….Cause Now I Can Really Empathise With Your Cause..But Nah Your Just A Boring Complainer!! The marlin is a game fish. They are incredibly hard to find, difficult to get hooked and they put up an unbelievable fight. 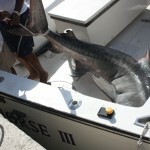 Catching a marlin is very difficult and the fish usually gets the best of the anglers and get away. 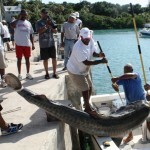 Very few of the large marlins have ever been caught. This compared to a shark that will literally swim up to any boat with it’s mouth wide open looking for food and when hooked give very little fight compared to other fish. 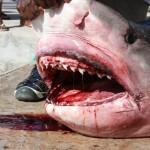 There is simply no skill involved in catching these sharks. 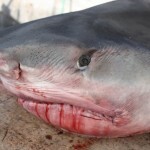 Boats on the challenger spend a good deal of time making sure the shark doesn’t eat they bait. 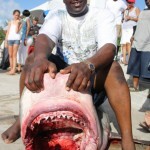 Its a real shame they killed the shark. Anyone that fishes on Challenger banks on a regular bases understands that these sharks are always out there swimming from boat to boat looking for handouts. They are fed continuously by all the boats fishing on the bank so putting a hook in one is certainly not a challenge. 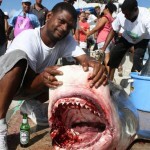 What is worse is that sharks don’t give the angler a fight. 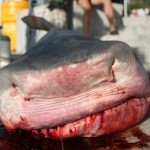 Sharks have absolutely no values as a sports fish they are just a dead weight on the end of a line. Where is the challenge in that? I only hope that now they have killed it they will eat it. 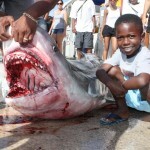 If you think it is acceptable to kill endangered sharks for sport can I suggest you take a couple of minutes to look at these photographs? 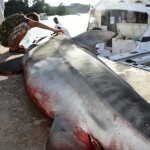 It is a sad fact that sharks will be extinct within two decades if we continue to kill them at the rate we are. You ppl need to relax !! damn tree huggers !! These guys have to make money, its not free to fish. 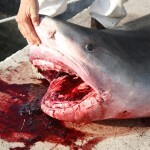 Go complain to some damn asians for killing all the damn sharks and whales. 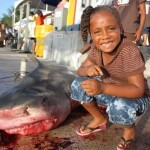 Bermuda’s need to fish/sharks will never have a global impact..Get the hell over it, or kill yourself !! I have been fishing all my life and I’m certainly not a tree hugged. 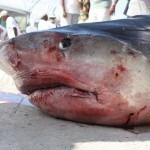 They killed this shark only because it was a shark. There is no challenge or sport in catching it and I don’t think you really want to eat it after it has been sitting on the deck of the boat for a few hours. The point is that if these guys were anything but total amateurs they would have left the shark alone. I am not an expert on fishing or wildlife in general but anyone can surely see that this is wrong!! Such a shame. 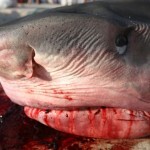 Hey Brainless – ever heard about sharks beeing endangered species? Why don’t you shoot Gorillas, Orang Utans, Lions or whales? same stuff like you do here…. another prime example of people being uneducated about the dire state of the worlds ecosystems. Yea alright, I’d really be proud if I killed just for f##king FUN dude – that’s just sad and pathetic. Also wrong and disgusting all the way.